Another item using lots of card and paper from my bits box. 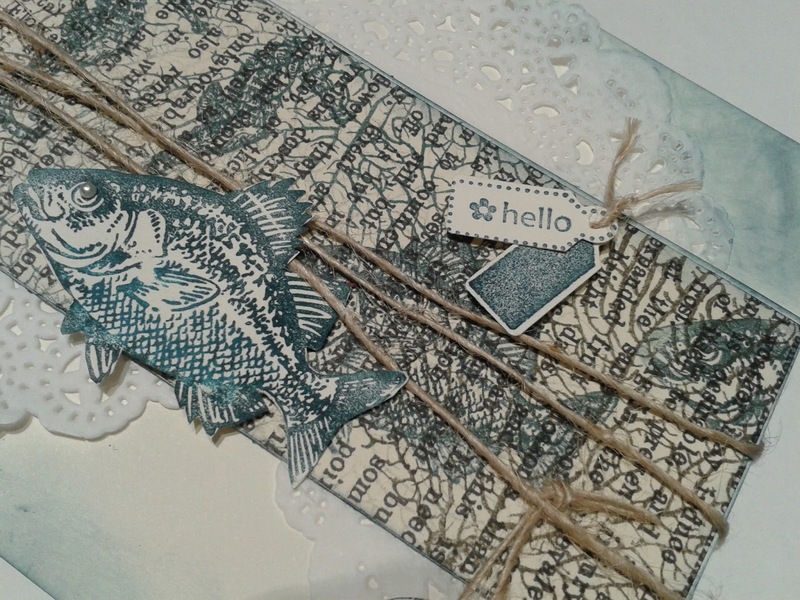 How many paper designs can you name? The butterfly punches have come into their own. So pretty. I'm getting quicker and better at rolling the flowers, not many in the bin today. 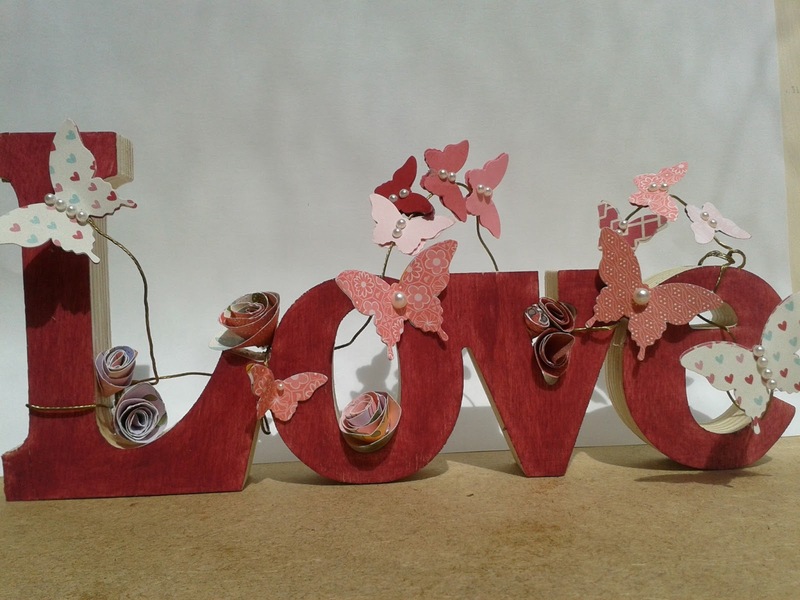 I've really enjoyed making, this it was a 3 o clock in the morning idea but stayed in my head untill I had got the other half to work! Hope you like it. Promise no pink next Friday. This is a little card I made at craft club last week at my friends house. Its a stamp I don't have but I did enjoy doing this. Its mostly colouring in. I think its cute! Haven't used this stamp set for a while. Back to clean lines. I plan to develop this idea to get a bit more distressing in next time. Love the blue its Pacific Point from the brights collection it just makes you think of the seaside. 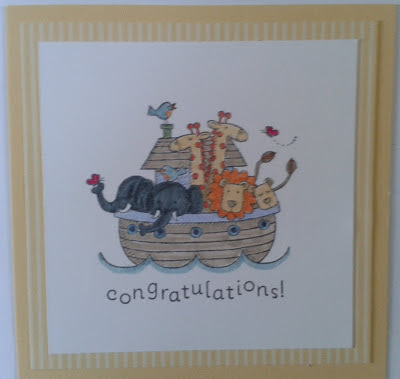 The stamps at the edge are from my off cuts box, in ice cream colours, found yesterday whilst rummaging. 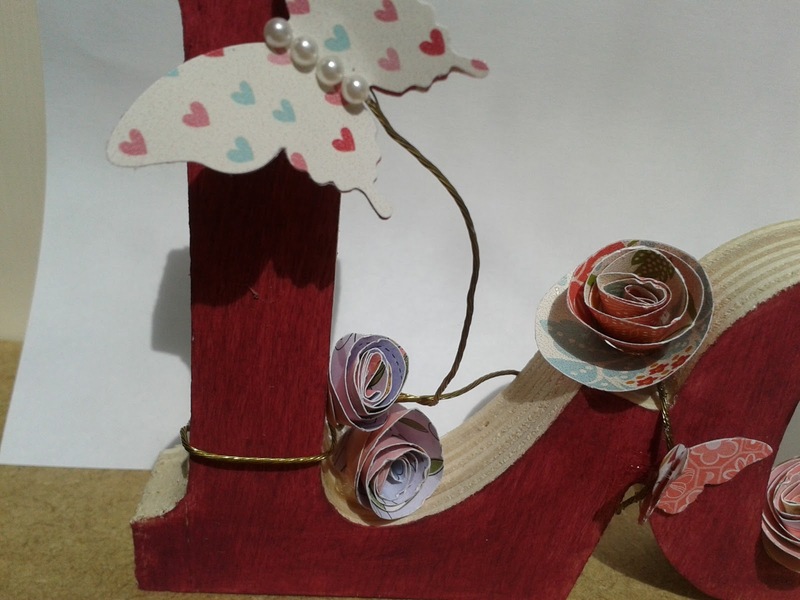 My off cuts box is overflowing so I thought a rummage would would come up with something. If you are like me you can't throw anything away. With the small curly label punch I set to work on all the DSP untill I had quite a pile, then I sorted them into colours. This little trio is the result. 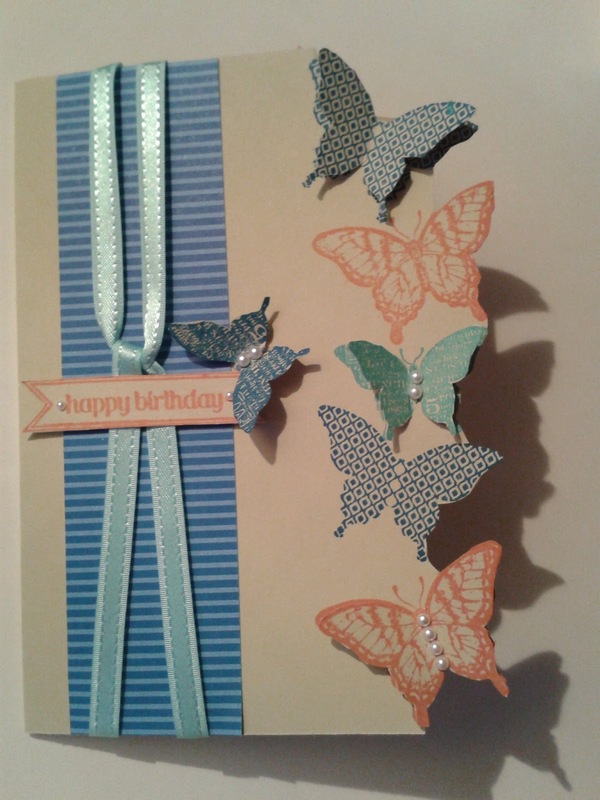 They could be classes as a quick card but I 'faff' so they weren't quick for me. 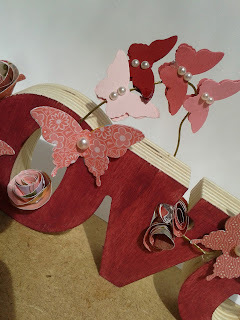 I think they are effective and look good in a pile of 5 with a ribbon tied around. I have cleared a little of the stuff in the box but will have to do some more. Perhaps I will have to have off cut Wednesday for a few weeks. I just had to show you all this. Its a new wool I have found. Quite easy to knit. This is one ball and took two evenings on big needles. It is so soft and fluffy it ought to purrrrr! I love the colour its like a soft oyster pink. The second picture is a true representation of the colour and texture. I am just about to start a plum coloured one. If you would like one knitting get in contact. This is something I have been working on for a while. Now finished I am very happy with it. 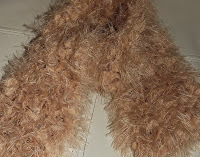 The close up photo looks so good I have put it on my facebook business page. .facebookCardCraftingClub. I don't seem to be able to post the link. Another learning curve to be tackled tomorrow. I haven't used this stamp set very often. So this is really a first attempt. I love the rich razzleberry colour of which I had a new unopened pack of card. 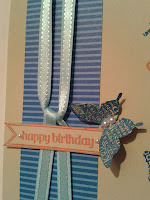 I matched with the paper stack DSP and the last of my matching ribbon. I have used the crystal glaze on the flowers then added a pearl. It took some time but has come together well. I have just noticed I have missed a petal with the crystal glaze. This stamp was still on my desk from Wednesday. I wanted to work in monochrome but I haven't any black card so I decided to go with the neutrals. This is clean and simple although not one layer. The colours have not come out the same despite being taken at the same time. For those who don't know SU colours well they are crumb cake DSP, chocolate chip card, and ink soft suade and sahara sand ink. Its a late post tonight. I have had a full on day being creative and my fingers are a rainbow of colours. I decided I had to work through my stamp sets and make one card with each over the next week. A duo of makes today. 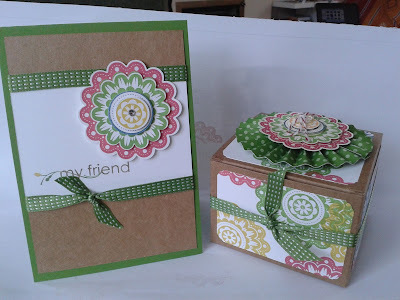 A gift box and a card in spring colours, not that its like spring outside! 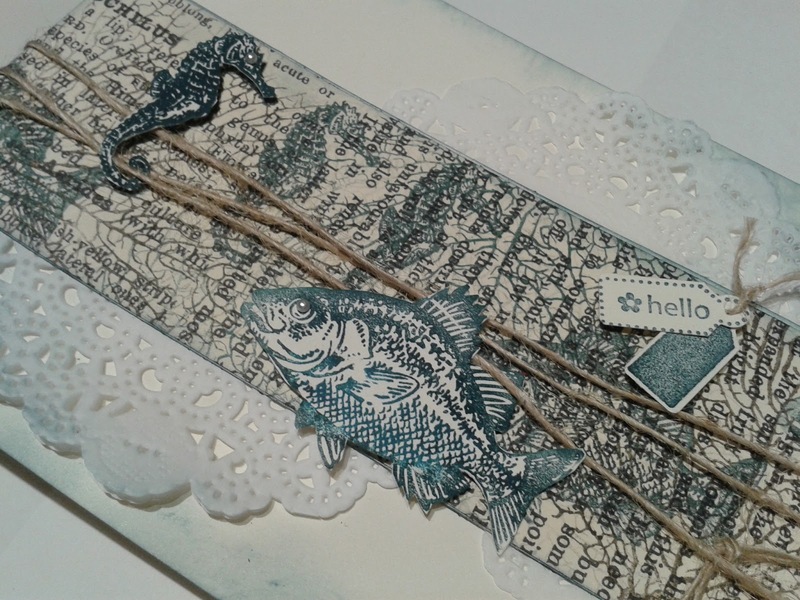 I really like this stamp it can be bright and cheery, monochrome or vintage. For the box I have used the stamp to make a background rather than using DSP. Not overlapping very much but using four of the in colours. I covered a sheet of whisper white A4 so have quite a bit left over for another card. The top of the lid has the stamped image punched into layers and topped with a button. 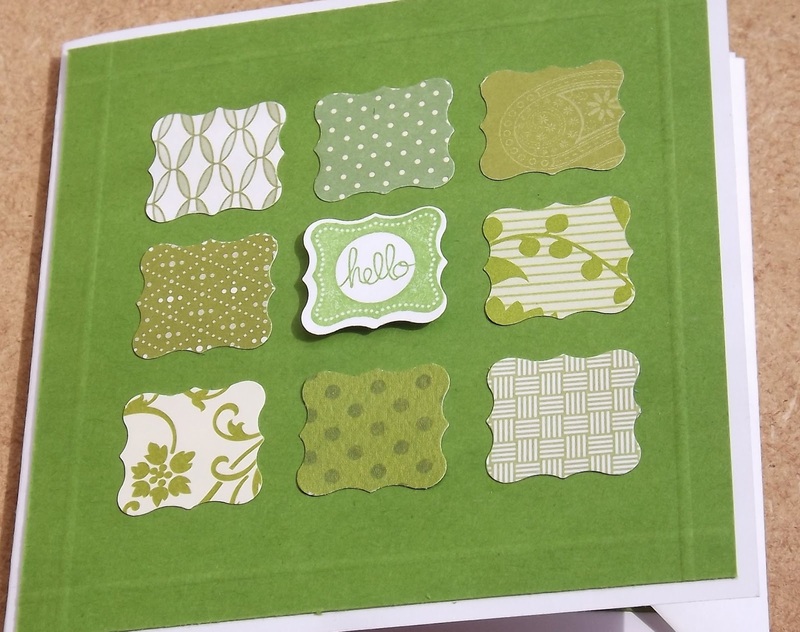 I have used the gumball green DSP to make the rosette. Just love the scoring board it makes life so much easier when creating these rosettes. The card is clean and simple. 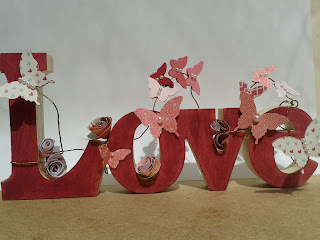 I have even managed to colour the flower on the sentiment a different colour to the letters without smudging or mixing. Swaps from the weekend will have to come tomorrow as I am having problems downloading from my phone. So today I have a card I have made for my new class in The Rainbow Cafe in King Cross. 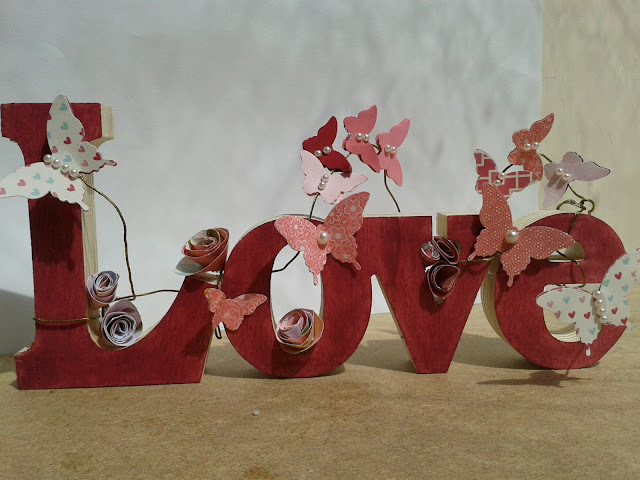 I have been up very early buzzing with ideas and this is one. 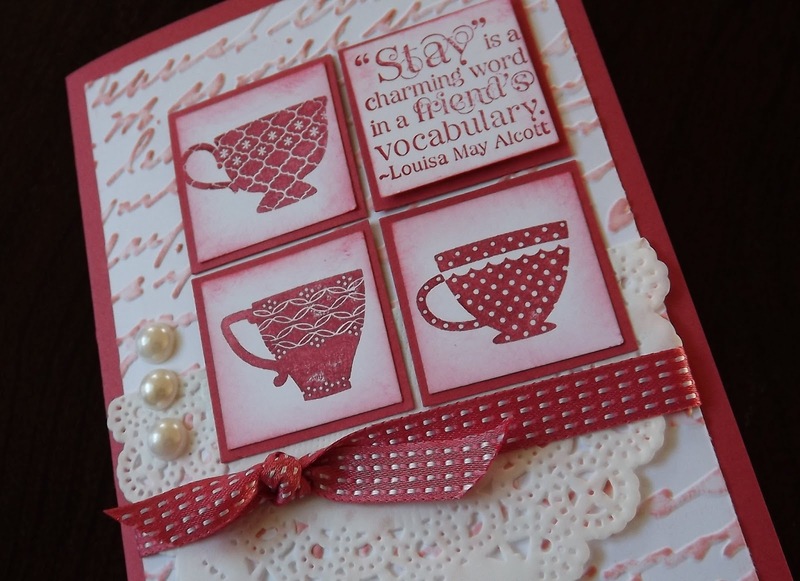 The class will be two cards and a tea bag/ biscuit holder. 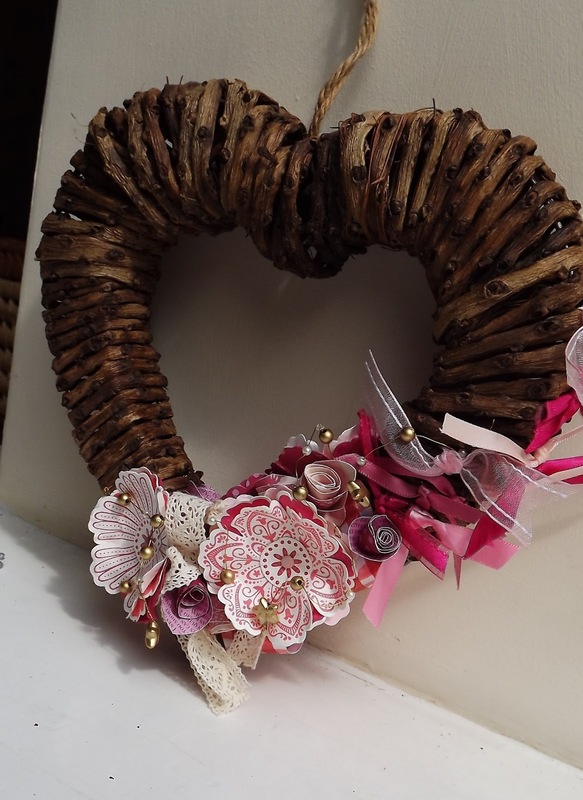 All worked in primrose petals and whisper white. Loving it. What a wonderful weekend I have had. I made an error on my blog yesterday. It wasn't convention I was attending but the Regional Training Event. It was brilliant. We started with a team meal on Friday night arranged by the lovely Sharon in Ironbridge. Then Sharon took us on a magical mystery tour. We laughed a lot. Just this is a good reason to join the team. Saturday was long but really interesting and I m not going to tell you any more you need to sign up to join in. I will share some of the wonderful swaps I received over the next few days. So many talented people in one place. The challenge. 3 of us were so motivated by the talks and discussion we have agreed on a challenge. 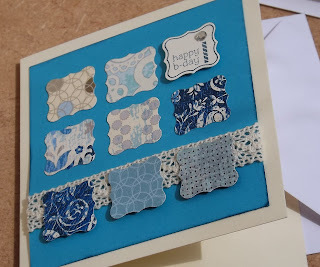 We will be holding Stampin Up retirement product parties during the first week in June followed by Catalogue launch parties in July with a very special sweetener. 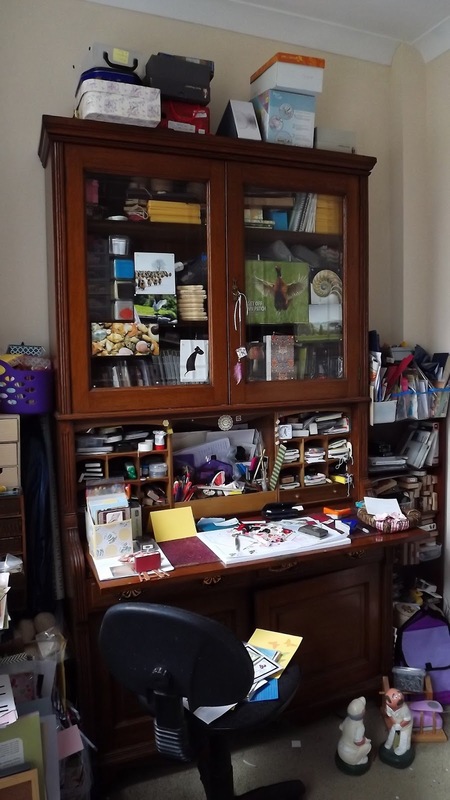 I have had to clear my craft room today as my desk bureau is no longer big enough so it is going up for sale on ebay. Clearing this has enabled me to sort out SU retired stock and non SU product which I am going to sell off. 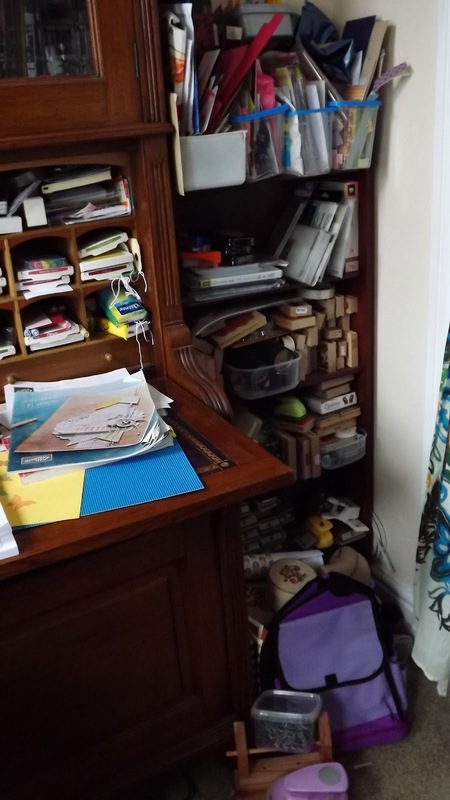 Here is what my craft space looked like this morning. 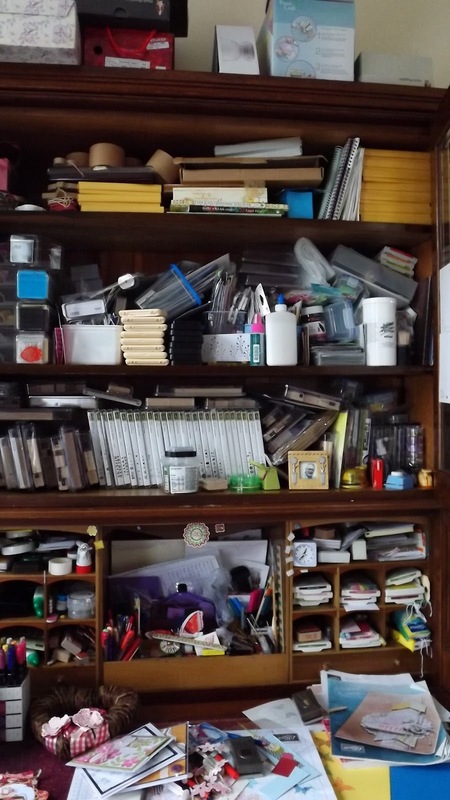 Actually this is very tidy for me. Well that's it from me today. back tomorrow with some swaps from the talented ladies I met yesterday and a picture of an empty desk but piled high bed. No visitors for a while! Today's post is the swap that |I will be giving out in Telford today. Its convention day and there will be over 300 people there. This will be my first convention so I am a little nervous. 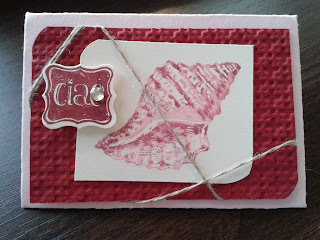 I have used the scallop envelope die with pink pirouette card, The shell is stamped with the thumping technique in pink pirouette and cherry cobbler. The matting layer is cherry cobbler with the square lattice embossing. I have used the linen thread to give it a more rustic feel. The greeting is from ciao baby stamp set and punched with the petite curly label punch. I will post next week some of the swaps that I receive. This little envelope is only 9cm x 6cm. Back with more on Monday. Enjoy your weekend. Another canvas today but no stamping. This is created using punches and DSP. It has a wide range of colour and a bit of bling, with a rhinestone on each butterfly. The canvas is just 5" x 7" the same as yesterdays. Today I have had a play with something a bit different. 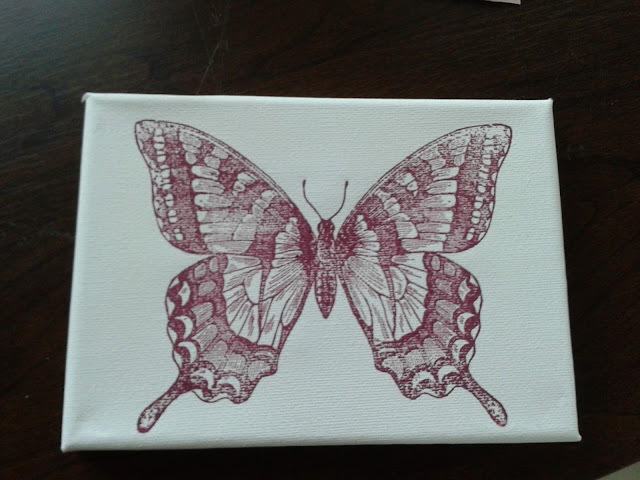 I have used a canvas to stamp onto. Its much easier than I thought but you have to be accurate first time as I found out The first one ended up in the bin as the butterfly looked drunk! I am going to have another go at this using more than one colour. Butterflies again but not the Swallowtail. 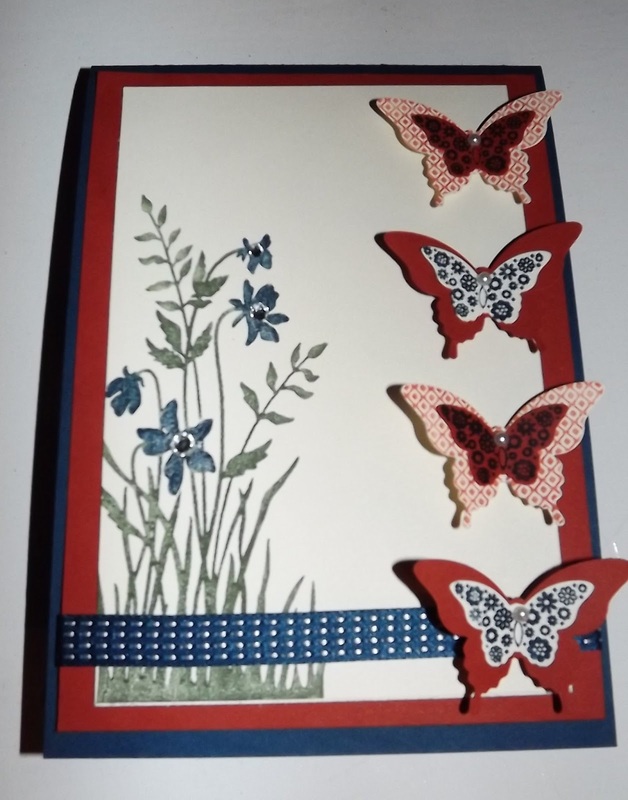 This is a lovely set of stamps, there are six different butterfly stamps in this set. This is card is cased from Julies Japes. I have used Tangerine Tango, Tempting Turquoise and Pacific Point. 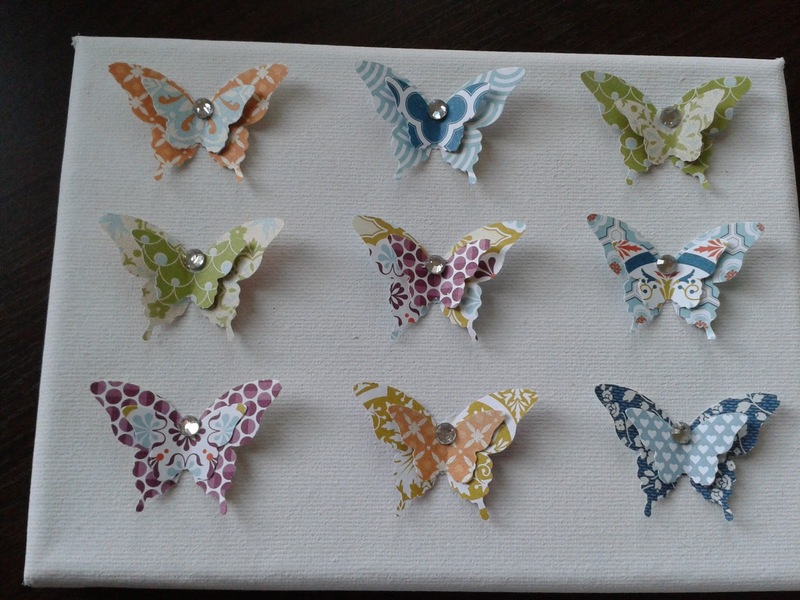 My desk is covered in butterflies, punched and cut out by hand so another card will be coming. Watch and see. 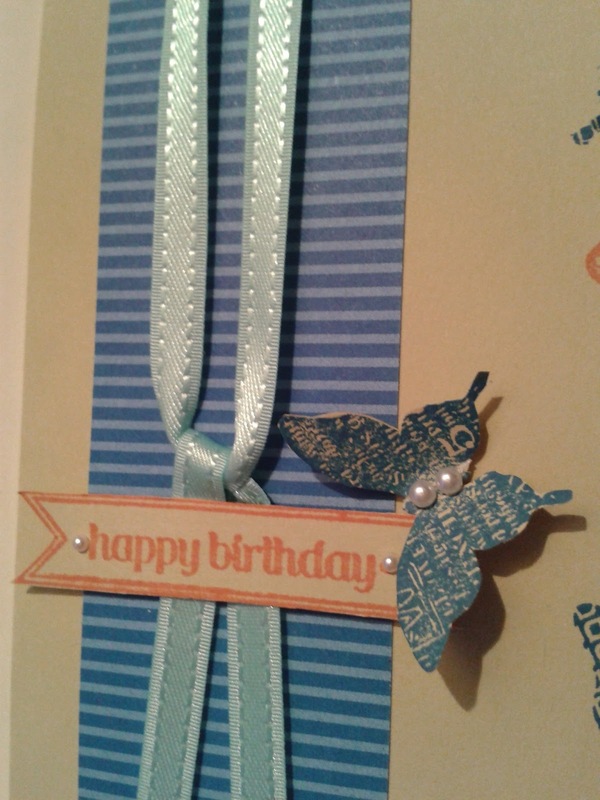 The pearls and shiny satin ribbon add to the overall effect. As the framelets were still ou,t along with lots of bits of card and paper from making the baby frame, I just had to use them again this one in pink, keeping it simple. The mix of colours make me think of spring weddings. Sorry about the picture quality not sure what is wrong but this is the sixth picture taken, the flash appears to have gone out of timing with the shutter! Not only have I cut, I have dry embossed the melon mambo jacket to give it a bit of texture. The DSP is not SU but the colours match with summer starfruit, melon mambo and the pink really well. 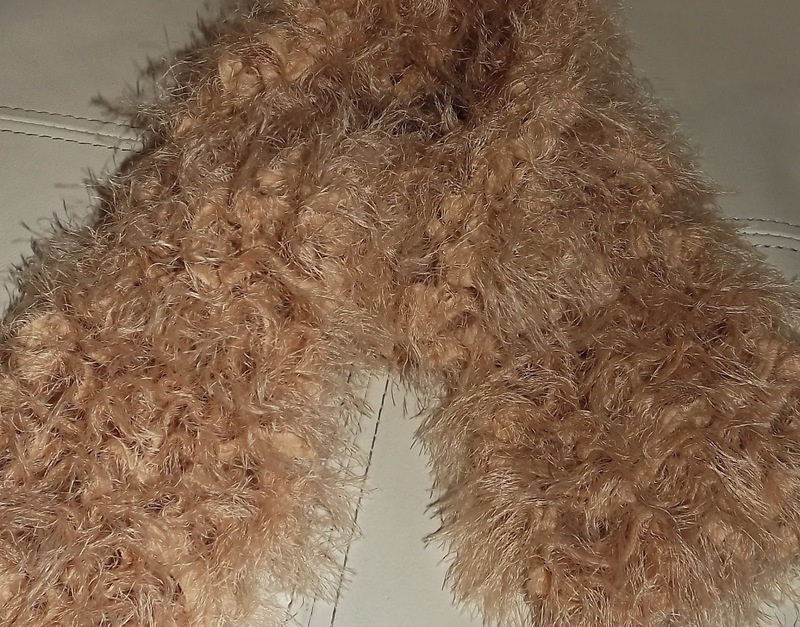 My dress up framelets arrived over 3 weeks ago and have finally made it out of the packet. I have started off with very simple makes. 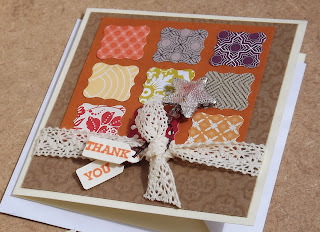 I have used cajun craze card and DSP from summer smooches. The stamp is from Tiny tags set and a coloured flower from the trim in the spring catalogue. 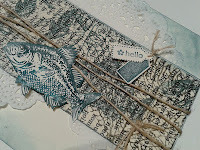 Second post today..... Had to let all my blog readers know about a fantastic new product from Stampin Up. 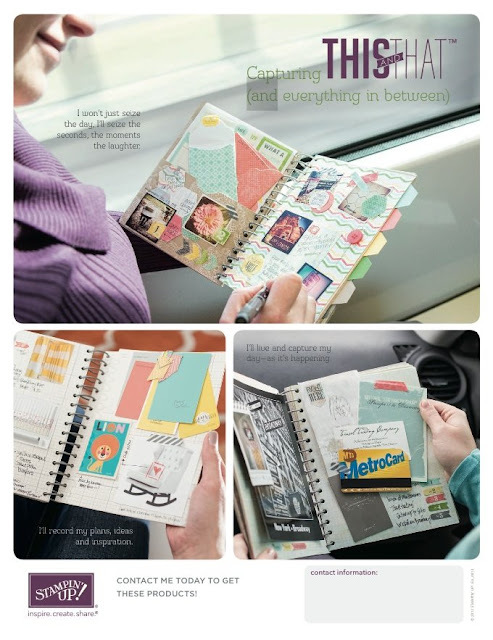 This and That is a journal type book with pockets and different layout pages. 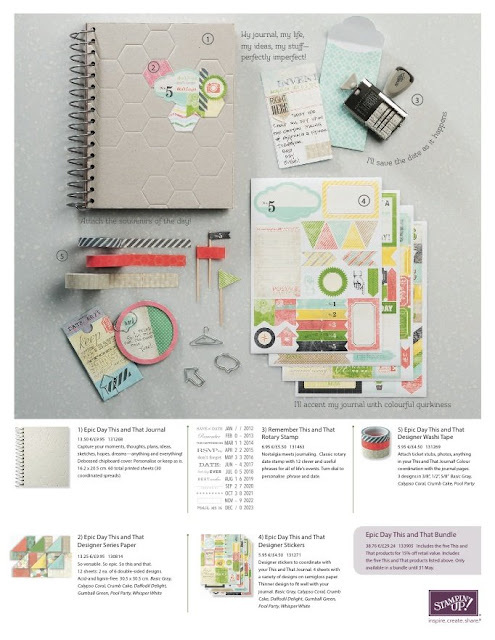 Great for collecting ideas, colour swatches, ticket stubs, photo's and all those little mementos you pick up each month but not sure what to do with. Special offer this month only. A huge 15% of the bundle price. The discount is only available during this month of May. I think this makes a great present idea and why not treat yourself at the same time. Orders placed generally arrive within 4-5 days. Contact details at the top of the page to place an order. Visitors still with us but keen to craft last night. 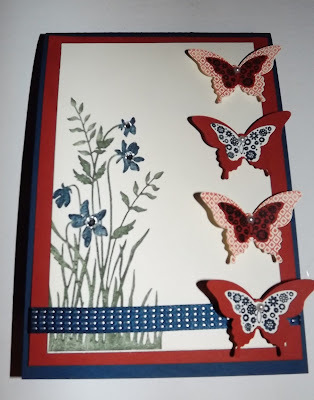 Sarah loved the butterfly punch so out came my newest stamp set that I haven't used yet. Fun all the way. 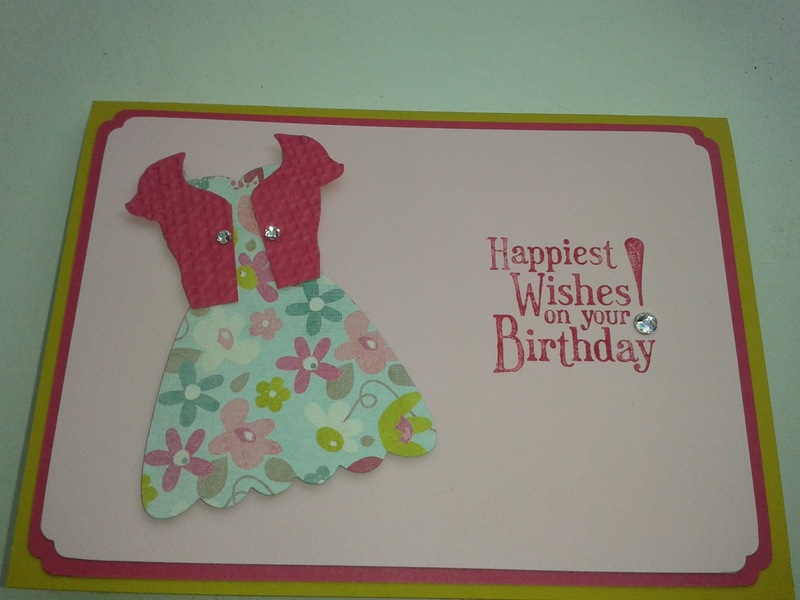 The Regals mixed card pack was to hand so we used those colours. Sarah chose the Cajun Craze with a Midnight Muse base that I already had cut and folded from yesterday. 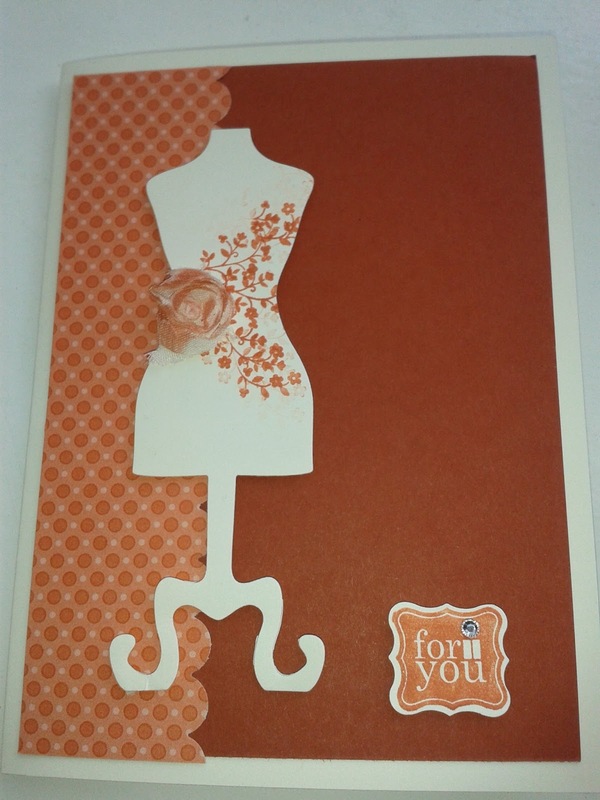 Although the blue theme was continued with Midnight Muze ink the Cajun Craze was a little dark so we used Tangerine Tango. The grasses and flowers are from I Believe. And she decorated the inside.